Winner for October is reiverix. Left side has four dwarf puffers. Right side has one arrowhead puffer. Onyx sand/Eco Complete mix substrate. Small powerhead for extra water flow. week and Flourish Excel daily. Winner for February 2007 is... Woland! Description: "120 gallon Juwel, home of "Babe" the Fahaka. 2 x 36 watt light. Inboard filtration is 2 x Fluval 4+ and the built-in Juwel filter, outboard filtration is a JBL 500. 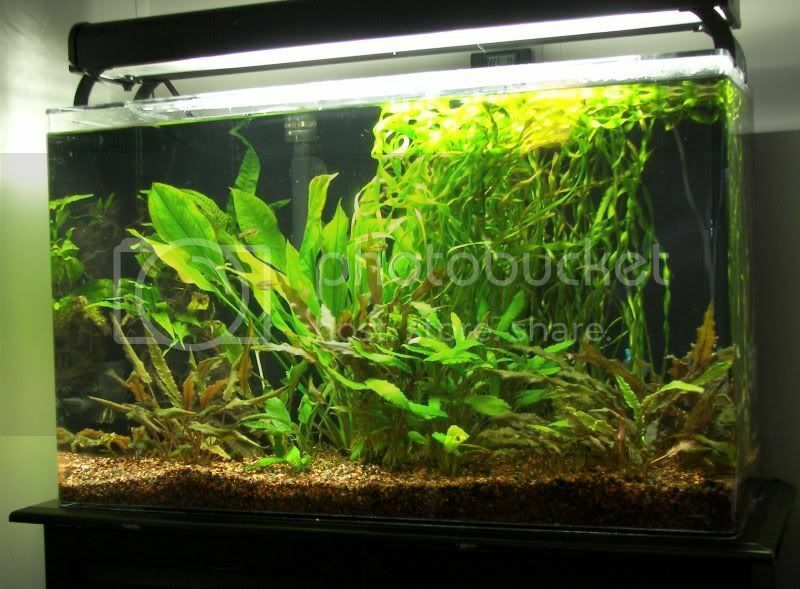 Substrate is smallish gravel, decoration is LOADS of rootwork and a multitude of non-demanding plants; java-moss, java-ferns, vals, anubias etc." Winner for March 2007 is... CoreyK! Description: "Aragonite substrate, ocean rock, artificial plants, Eheim 2213 canister, 1 filtered Aquaclear powerhead, 1 non-filtered powerhead." Winner for June 2007 is... Phaedrus! Description: "Five baby Figure8s. Fluval 304 canister with surface skimmer, Eheim Aquaball powerhead, Marineland 200W heater, 2x Hagen Life-glo2 bulbs, Caribsea Aragonite substrate."